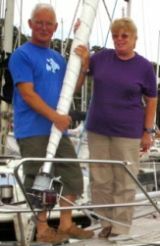 A former journalist couple were celebrating the scoop of their lives after winning £6m on the National Lottery while on a sailing trip round Britain. Richard and Cathy Brown, left, who worked on Archant titles the East Anglian Daily Times and the Ipswich Star, found out they had won the jackpot while moored in a marina in Newcastle. The couple were on a sailing trip around the UK on their 40ft yacht Brave and found out they had won the massive prize after Richard decided to test out a Lotto app to check the numbers for the 29 May draw. Richard, 66, is a former deputy editor of the EADT and sub-editor of the Star, while his wife Cathy, 64, was a features writer for the EADT and also a former editor of Let’s Talk magazine based in Norwich. The Star reports that the couple celebrated the jackpot win with a gin and tonic in a Newcastle bar. Following their win, they made a U-turn on their sailing trip around Britain and returned to Ipswich. Speaking at a press conference, Richard said: “We tend to buy a month’s worth of tickets in our local Sainsburys for the Lotto draw. Before we set off on our adventure around Britain I had stocked up for the first month. “As we were settling in for the evening in Newcastle, I decided to use the app I had downloaded as a bit of an experiment. “Cathy was looking over my shoulder, first of all to see the app in action and then we both realised we had four, five, and then six of the numbers. The retired couple, who do not have children, downsized their house to buy their current yacht and now plan to buy a new yacht and a bigger house. The couple won a total of £6,123,395 by picking the winning numbers of 3, 5, 25, 33, 34, 35 and the bonus number of 14.
yea…. great to hear a good news story like this. Good luck to them and all the good they can do. You’d think they would have more sense than to tell the papers they’d won. They could buy JP for that amount. Then have enough change left over for a Lamborghini Veneno. Made redundant by Archant and then win the Lottery. There are quite a few others out there with the same dream. Good on you both.